Jackie Sibblies Drury delivers a rousing attack on insidious racial bias. Molly Grogan reviews. 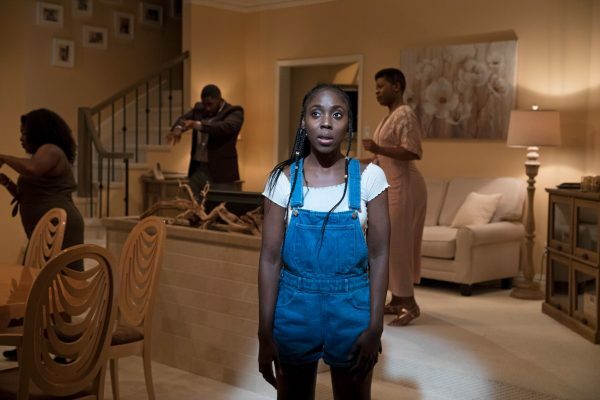 Jackie Sibblies Drury’s Fairview begins as a stock family comedy: a flustered wife is stressing over preparations for a dinner in honor of the family’s revered matriarch, and nothing is going right. In this case, Beverly and Dayton are hosting the party in their comfortably appointed home, but sister Jasmine has an axe to grind with everyone, teen daughter Keisha is experiencing a wave of pre-college anxiety, brother Tyrone has missed his flight and Mama has locked herself in the bathroom. The scenario is stultifyingly simplistic from a writer the caliber of Sibblies Drury (winner of the Windham-Campbell Literature Prize in Drama and the United States Artists Donnelly Fellowship, in her second appearance at SoHo Rep). Of course, we laugh at the well-timed jokes, dance numbers and antics so agilely lifted from TV comedy and delivered by the faultless cast: Heather Alicia Simms as the type A Beverly, Roslyn Ruff (most recently in X: Or, Betty Shabazz v. The Nation) as the conniving Jasmine, Charles Browning as the conciliating Dayton and MaYaa Boateng as the ebullient Keisha. Yet the idea also forms, ineluctably, that the genre and the story are vehicles for some more important business. That proves true in the play’s second act where the playwright lands a sucker punch. Even if the audience guessed something was afoot, they could never see what was coming or with what force. Critics often talk about how writers explore a topic, and maybe struggle with it. Watching the unraveling of the Frasier family’s dinner, in Brechtian fashion (there is no fourth wall here, and the intimacy created between actors and audience is very deliberate and necessary), it feels like we are observing the stages of Sibblies Drury’s frustration as she created this play. In some early iteration, Fairview might have been conceived as a story about a single moment in the life of an African American family, but on the stage of SoHo Rep – and notwithstanding designer Mimi Lien’s neutral-to-a-fault living area where the action takes place – Sibblies Drury’s focus has become not just bigger, but of massive import. Frantz Fanon, whose 1952 essay, Peau noire, masques blancs, provides the script’s epigraph, defined as “white masks” the behaviors and status symbols adopted by educated blacks to imitate the culture of the colonizer (Fanon was a descendant of African slaves taken to Martinique by the French in its colonization of the Caribbean). To our intruding gaze, Sibblies Drury offers this “Fairview” of African American success, with its promise of a leafy neighborhood, good schools and a Subaru in every driveway. The Frasiers have clearly “made it,” a point Sibblies Drury drives home by inflating Beverly’s dinner party into a banquet of grotesque proportions that culminates in a food fight. But much like the way the family destroys their own dinner, Sibblies Drury tears this middle class family apart, over and over and over again. Sibblies Drury is working with a bold palette here, a far remove from the black-and-white still life of Really (2016), which examined the same theme, in miniature and with metaphor. Here, she is writing an essay on race as much as a fiction about it, a feat made possible when the conceit of the family gathering in Act One becomes, in Act Two, a projection screen for a hailstorm of racial and ethnic preconceptions, judgements and stereotypes. These are delivered by four invisible characters (played with a savage zest for irony by Hannah Cabell, Natalia Payne, Jed Resnick and Luke Robertson) who comment on the action in the Frasiers’ living room as it unfolds, as if the family members were objects of a psychological study being watched through a two-way mirror. The disembodied voices also engage in the most puerile kind of party talk about “what race [they] would chose to be.” The discussion is light at first, then a bit wicked before becoming squirm-in-your seat-uncomfortable: Asians are “traditional,” Latinos are “muy caliente,” Blacks are just “poor” and Turks are defined as an “interesting” race to be…no matter that only two of these “races” are, in fact, that. Sibblies Drury writes with a blistering disdain for these conversations and the racial privilege and implicit superiority they come from but are meant to hide. You also sense she has heard talk like this before at some cocktail party, so exquisitely attuned the writing is to the ways race is bandied around in casual interactions. But, at this point, we’re only halfway through the play’s two hours, and there are many more provocations to come. The audience’s surprised reactions to the play’s turns are particularly important to Fairview’s success in getting its point across. I’ll only say that those off-stage characters get their wish to play at being different races, and we in the audience will have to make some choices of our own, without any fooling around. By the time Fairview is over, the Frasiers’ party, and whatever misplaced fun we were having watching it, is over too. In a panel at the Schomburg Center last January with fellow SoHo Rep artists Branden Jacobs Jenkins and Aleshea Harris, Sibblies Drury spoke of the responsibility she and her fellow panelists feel to represent their race every time they write. In Fairview, she is working out those representations while railing against a system where creating art about black identity, or even writing a family comedy in which the characters happen to be black, is impossibly compromised in a context where patronage, consumption and recognition are driven largely, if not exclusively, by white demand. There is a moment in Fairview when the white characters’ prejudices determine the fates of the Frasiers; in the gaze of the whites, the African American family can no longer be upwardly mobile but are reduced to insidious stereotypes: crack moms, teenage mothers, addicts and deadbeat dads. One of the white characters, Bets (who opines in a disdainful French accent on the question – because race is not acknowledged by the French constitution) provides a pat explanation: “everything in America is race, race, race, all the people talk is race, race, race,” she says, that it’s no longer a relevant construct; in fact, it’s “boring.” But the Frasiers’ swift demise delivers a sharp whiplash and a crushing realization: are crudely drawn stereotypes what we want from every story about African American lives and how complicit are we in allowing that situation to exist? But when the curtain falls on Fairview, her fears are much clearer, and we are all more attentive interpreters of race, including our own, thanks to that clarity. Fairview runs to July 22, 2018. More production info can be found here.